On January 29, Iran tested a new ballistic missile it dubbed the Khorramshahr, which reportedly flew a distance of about 1,000 kilometers. Little is known about the missile, though some have speculated that it relies on a liquid-fueled engine originally developed by the Isayev Design Bureau for the Soviet R-27 submarine-launched ballistic missile. If so, this could make it a variant of the North Korean Musudan (KN-10), an intermediate-range ballistic missile (IRBM) that uses the same engine and that Pyongyang began flight testing in 2016. The ramifications of such a connection would be significant, not only because it would signify ongoing close Iranian-North Korean missile cooperation, but also because such an engine would be a foundation for Iran to develop a viable intercontinental ballistic missile (ICBM). However, contrary to some assertions, the available evidence cannot verify speculation that the Iranian missile is similar to North Korea’s Musudan, or reports that Pyongyang exported R-27 engines to Iran. Media reports citing US government officials claim the missile traveled about 1,000 kilometers, but its re-entry vehicle exploded before the flight was complete. It is unclear whether the explosion was the result of an accidental or a deliberate detonation. Officials did not provide details about the type of missile tested, though an anonymous Pentagon official informed Reuters that it was the same kind of missile tested in July 2016, and that the launch occurred near Semnan, a known missile-test site west of Tehran. However, it remains uncertain whether the missile utilized North Korean technology or was based on the Musudan IRBM. Fox News asserted that Iran tested a BM-25 missile, built with R-27 engine technology imported from North Korea in July 2016. However, that report was not independently confirmed by other media sources. Moreover, during a briefing to journalists on February 1, 2017, a National Security Council official described the missile tested as a Shahab, a missile based on older North Korean technology. Given these uncertainties, there are four possibilities regarding Iran’s new ballistic missile, ordered from most likely to least likely. The first possibility is that Iran tested a Shahab-3 medium-range ballistic missile (MRBM) based on North Korea’s Nodong missile. Initially test fired by Tehran in 1998, this weapon has a range of 950 kilometers when carrying a 1,000-kg warhead. Iran has created variants of the Shahab-3 called the Ghadr, and most recently the Emad, which deliver a smaller 750-kg payload to roughly 1,600 kilometers. The Emad, the most recent design, is similar to the Ghadr, but in principle could become more accurate since fins on its base allow the warhead to alter its flight path as it re-enters the atmosphere. Perfecting the new re-entry vehicle design requires Iran to conduct a dozen or more flight tests, essentially creating a new missile. The second possibility is that the missile tested was a variant of the Shahab-2, based on the North’s Scud-C missile that was imported by Iran from North Korea in the late-1980s and early-1990s, called the Qiam. It has a maximum range of about 700 kilometers, which would seemingly eliminate it as well as any other Scud variants as the possible subject of the recent test flight. However, North Korea unveiled and tested a one-meter diameter Scud in the summer of 2016 capable of reaching a distance of about 1,000 kilometers. There is no evidence to suggest Pyongyang has transferred one-meter Scuds to Tehran, but it is within Iran’s technical and industrial capacity to develop a clone of the North Korean missile. Third, the recent Iranian test may have been a solid-fueled missile derived from Iran’s Sajjil program which has not been tested since 2011. A missile consisting of only the Sajjil’s first stage would have an approximate range of 1,000 kilometers and could be used to target Arab Gulf states and US forces in the region from less-vulnerable launch positions in Iran’s interior. The final and least likely possibility is that Iran tested a missile that is essentially the same as the North Korean Musudan. This is unlikely for three reasons. 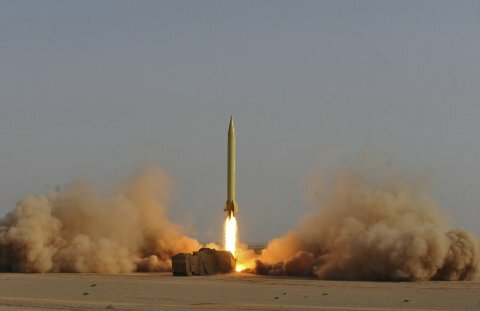 First, if the Iranian missile were modeled on the 3,000 kilometer-range Musudan, it would be an intermediate-range ballistic missile, contrary to the US description of the Khorramshahr as a medium-range ballistic missile. Second, while the July 2016 and January 2017 test flights conducted by Iran were largely successful, North Korea’s tests of the Musudan failed soon after launch in six of eight attempts, a wide discrepancy that is difficult to explain even if, as some might assert, Iran is more capable at missile development. Finally, flying a Musudan to only 1,000 kilometers is unnecessary for Iran, since it has a much larger flight corridor within which test flights can be performed and has done so. There is also no reason to believe that Iran could not test a BM-25 to maximum range—instead, if the Khorramshahr is based on the BM-25, it would have flown a very lofted trajectory. In fact, the flight paths associated with each of the possibilities vary considerably, with a possible BM-25 launch flying to the highest altitude, and the one-meter Scud taking the flattest trajectory. The countries monitoring Iranian air space would certainly be able to distinguish between a BM-25 missile test from one involving a Ghadr or Emad. A one-meter Scud missile test would differ from either a BM-25 or Ghadr/Emad test. If a single-stage missile based on Sajjil technology were tested, its flight path and acceleration profile during boost phase would be different from that of a one-meter Scud. Given these differences, it is difficult to imagine that the US government does not know the identity of the missiles tested last July and in January 2017. The strategic implications of Tehran’s recent missile test and the possibility of continued missile cooperation with Pyongyang vary depending on what was actually launched. If the Khorramshahr was a Shahab-3 variant based, in part, on old Nodong technology acquired from North Korea years ago, then Iran is keeping with a pattern it has pursued over the past half dozen years—prioritizing greater accuracy and enhanced military utility. However, it would not be evidence of ongoing missile cooperation with North Korea. If the test involved either a one-meter Scud or a single-stage version of the Sajjil, then Iran has refocused its missile acquisition efforts in an attempt to diversify its stockpile and increase operational flexibility. In this case, only the development of a one-meter Scud would indicate ongoing cooperation with Pyongyang. Finally, in the least likely scenario, if the Khorramshahr did employ an R-27 engine, which uses high-performance propellants, it would signify that not only does Iran continue to have close missile cooperation with North Korea, it could also develop a road-mobile, two-stage intercontinental ballistic missile capable of striking the US mainland. However, such a development would not occur overnight, and would require four or five years of observable flight tests. “U.S.-RUSSIA JOINT THREAT ASSESSMENT TALKS – DECEMBER 2009,” Wikileaks, February 24, 2010, https://wikileaks.org/plusd/cables/10STATE17263_a.html.